Once the uniform of the disciplined Royal Navy, the blazer now plays a major role in the modern gent’s wardrobe. Whether worn for work or play, this timeless piece offers a stylish and smart option that can be dressed up or down to suit the occasion. Regular readers will already know that red is big news for SS14. Perfect for those who like to stand out from the crowd, the red blazer is a sure-fire way of telling passers-by you mean business. Whether worn for a night out on the town or to dinner with your loved ones, this bold statement option will breathe new life into your summer-ready wardrobe. A wide variety of hues are available on the market this season, from primary red and vibrant cherry to softer shades of crimson and pastel pink. If you’re looking for an option you can utilise all year round, consider a richer burgundy or berry hue – both look just as good paired with tweed trousers in winter as they do teamed with white shorts in summer. 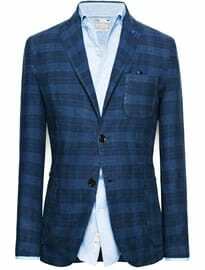 When it comes to styling, be sure to keep the rest of your outfit simple and let the blazer take centre stage. A white shirt, navy trousers and tasselled loafers combination would make a sensible, everyday choice. However, for something more summer-appropriate, try combining with white jeans and a pair of suede drivers. We Recommend: Pairing with nautical-inspired colours such as white and navy, particularly in the form of Breton stripes. Similar Colours: Shades of purple and orange. Contrasting Colours: Shades of blue and yellow. Complementary Colour (Hardest To Pair): Green. Subtle yet highly effective, the white blazer has, over recent years, developed into modern must-have. Oozing style and sophistication, it will add a Gatsby-esque twist to any warm-weather ensemble. Although white-on-white outfits are on trend this SS14, don’t get it twisted – a white blazer makes a versatile and timeless addition to any wardrobe, and will continue to get good use each spring/summer for many more years to come. Able to be dressed up or down while anchoring any colour under the sun, this contemporary essential will give your work-to-weekend attire a whole new outlook. To incorporate into your own outfits, we suggest taking inspiration from Jay Gatsby himself and going all out with a perfectly tailored white three-piece – the ideal suit for any summer event. For something more relaxed, take things down a notch by teaming with a sky blue shirt, navy chinos and brown loafers for a night on the town, switching for a polo, jeans and brogues combination for lunch in the city. Obviously, white is not the most practical option on this list, which makes this blazer more suited to high summer and holidaying. For those who want to invest in a version they can wear all year round, consider picking up one in a slightly darker beige tone. We Recommend: Pair with patterns, colours, neutrals, other white pieces – anything goes. Looks Great In: Riviera-inspired outfits. While the navy blazer is perhaps one of the most well-documented wardrobe staples, this season you should be considering something a little more vibrant. Ideal for those who want to venture into the world of colour without pushing their boundaries too far, the blue blazer (in bright or pale hues) is what you would call a happy medium. Not too flashy, yet strong enough to set you apart from the crowd, this fail-safe option is a must-own for the sunnier months ahead. Key shades to consider for SS14 would be cobalt or sky/baby blue, the first of which is on trend and bold enough to make an effortless statement while the latter is slightly more understated and the epitome of Riviera chic. In terms of outfit options, you can go in two different directions. For something daring and summery, team with white trousers and loafers when going smart, or coloured chinos and espadrilles at the weekend. For those who wish to play it slightly safer (but remain just as stylish), team yours with lightweight grey trousers, a neutral coloured shirt and pair of suede Derbies. We Recommend: Pairing tonally with shades of blue. Similar Colours: Shades of purple, green and turquoise. 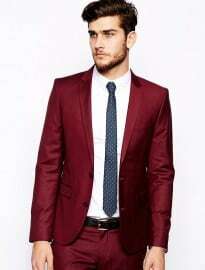 Contrasting Colours: Shades of red and yellow. Complementary Colour (Hardest To Pair): Orange. Although green is a continually underused (and underrated) colour within menswear, it’s much more versatile than you might first think. A favourite on the SS14 runways of Burberry Prorsum and Emporio Armani, we highly recommend you jump on the bandwagon early. 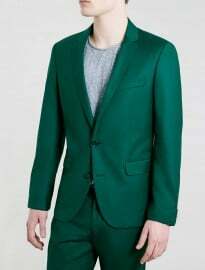 With that in mind, this season consider investing in a dark green blazer – think rich shades of forest, racing or bottle green. All of these can be utilised year-round, with Earth tones a perennial favourite during autumn/winter. That’s not to say you can’t consider a more striking, summer-appropriate mint green version. One of the more masculine pastel hues, it’s subtler and more wearable than pink or yellow yet rarer than sky blue, allowing you to make an effortless statement. When crafting your outfits, keep your surrounding colour palette natural and simple. Khaki, navy or white should be the go-to hues, while tonal outfits – using darker/lighter shades of green – are also an option for the more advanced. Try teaming yours with a crew neck jumper, trousers and penny loafers for a meal in a restaurant, switching for a white tee, chinos and deck shoes combination at the weekend. We Recommend: Pairing with navy, white and Earth tones. Similar Colours: Yellow and blue. Contrasting Colours: Shades of purple or orange. Complementary Colour (Hardest To Pair): Red. With the industry still very much enamoured with prints, now is the perfect time to add a subtly patterned blazer to your wardrobe – with checks our choice for SS14. Ideal for giving your day-to-night looks an eye-catching twist, this timeless motif will never fall out of style and can be dressed up or down with ease. Our only recommendations would be to opt for a neutral base tone – grey, blue, brown – and a lightweight fabric to ensure versatility and comfort. 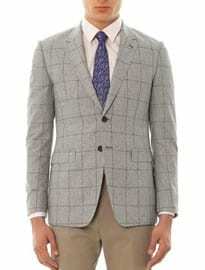 For those that work in business-casual environments, this style of jacket can be just the thing to help separate your look from the rest of the workforce. Dress it up with a shirt, tie and tailored trousers combination during the day; then lose the tie, switch the shirt for a polo and pop a pocket square into your top pocket for after-work drinks. When creating off-duty looks, just remember to anchor the jacket with classic, neutral staples: khaki chinos, white/blue Oxford shirts, indigo denim etc. So there you have it, the five blazer styles that should be on your radar for SS14. Whether you opt for bold and eye-catching red or subtle yet effective white, each would make a versatile and worthwhile addition to your ever-expanding collection. But as always, we want to know what you think: will you be investing in one or more of the above this season? 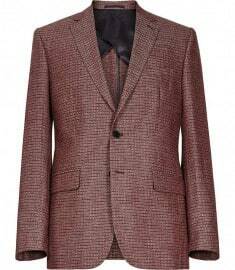 What is set to become your go-to blazer for SS14? 12 Cool Hairstyles For Men That Have Stood The Test Of Time Get ready to join the follicular hall of fame The Best Smart Casual Dressing Guide You'll Ever Read Finally, some answers How To Tell If A Girl Likes You Does she give great text, but become elusive when it comes to making a date?